Internal United Nations assessments obtained by The Intercept reveal that U.S. and European sanctions are punishing ordinary Syrians and crippling aid work during the largest humanitarian emergency since World War II. The sanctions and war have destabilized every sector of Syria’s economy, transforming a once self-sufficient country into an aid-dependent nation. But aid is hard to come by, with sanctions blocking access to blood safety equipment, medicines, medical devices, food, fuel, water pumps, spare parts for power plants, and more. U.S. sanctions on Syrian banks have made the transfer of funds into the country nearly impossible. Even when a transaction is legal, banks are reluctant to process funds related to Syria for risk of incurring violation fees. This has given rise to an unofficial and unregulated network of money exchanges that lacks transparency, making it easier for extremist groups like ISIS and al Qaeda to divert funds undetected. The difficulty of transferring money is also preventing aid groups from paying local staff and suppliers, which has “delayed or prevented the delivery of development assistance in both government and besieged areas,” according to the report. Trade restrictions on Syria are even more convoluted. Items that contain 10 percent or more of U.S. content, including medical devices, are banned from export to Syria. Aid groups wishing to bypass this rule have to apply for a special license, but the licensing bureaucracy is a nightmare to navigate, often requiring expensive lawyers that cost far more than the items being exported. Syria was first subjected to sanctions in 1979, after the U.S. designated the Syrian government as a state sponsor of terrorism. More sanctions were added in subsequent years, though none more extreme than the restrictions imposed in 2011 in response to the Syrian government’s deadly crackdown on protesters. In 2013 the sanctions were eased but only in opposition areas. Around the same time, the CIA began directly shipping weapons to armed insurgents at a colossal cost of nearly $1 billion a year, effectively adding fuel to the conflict while U.S. sanctions obstructed emergency assistance to civilians caught in the crossfire. 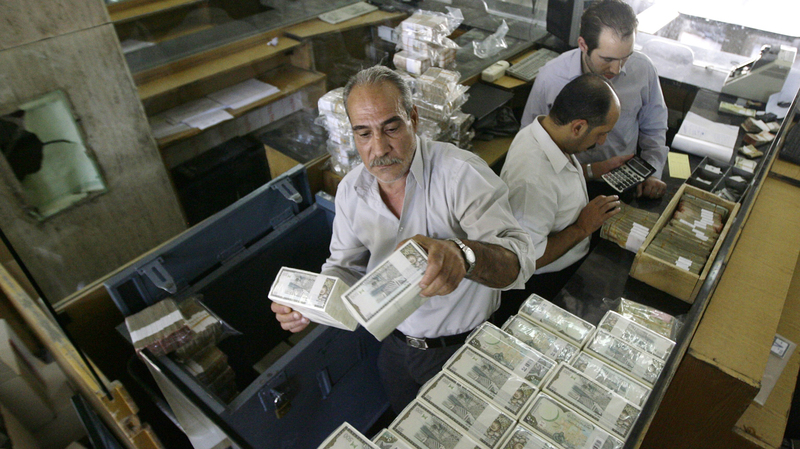 A man stacks packed Syrian lira bills at the Central Bank in Damascus on Aug. 25, 2011. An internal U.N. email obtained by The Intercept also faults U.S. and EU sanctions for contributing to food shortages and deteriorations in health care. The August email from a key U.N. official warned that sanctions had contributed to a doubling in fuel prices in 18 months and a 40 percent drop in wheat production since 2010, causing the price of wheat flour to soar by 300 percent and rice by 650 percent. The email went on to cite sanctions as a “principal factor” in the erosion of Syria’s health care system. Medicine-producing factories that haven’t been completely destroyed by the fighting have been forced to close because of sanctions-related restrictions on raw materials and foreign currency, the email said.As one NGO worker in Damascus told The Intercept, there are cars, buses, water systems, and power stations that are in serious need of repair all across the country, but it takes months to procure spare parts and there’s no time to wait. So aid groups opt for cheap Chinese options or big suppliers that have the proper licensing, but the big suppliers can charge as much as they want. If the price is unaffordable, systems break down and more and more people die from dirty water, preventable diseases, and a reduced quality of life. Such conditions would be devastating for any country. In war-torn Syria, where an estimated 13 million people are dependent on humanitarian assistance, the sanctions are compounding the chaos. In an emailed statement to The Intercept, the State Department denied that the sanctions are hurting civilians. “U.S. sanctions against [Syrian President Bashar al-Assad], his backers, and the regime deprive these actors of resources that could be used to further the bloody campaign Assad continues to wage against his own people,” said the statement, which recycled talking points that justified sanctions against Iraq in 1990s. The U.S. continued to rationalize the Iraq sanctions even after a report was released by UNICEF in 1999 that showed a doubling in mortality rates for children under the age of 5 after sanctions were imposed in the wake of the Gulf War, and the death of 500,000 children. Meanwhile, in cities controlled by ISIS, the U.S. has employed some of the same tactics it condemns. For example, U.S.-backed ground forces laid siege to Manbij, a city in northern Syria not far from Aleppo that is home to tens of thousands of civilians. U.S. airstrikes pounded the city over the summer, killing up to 125 civilians in a single attack. The U.S. also used airstrikes to drive ISIS out of Kobane, Ramadi, and Fallujah, leaving behind flattened neighborhoods. In Fallujah, residents resorted to eating soup made from grass and 140 people reportedly died from lack of food and medicine during the siege. 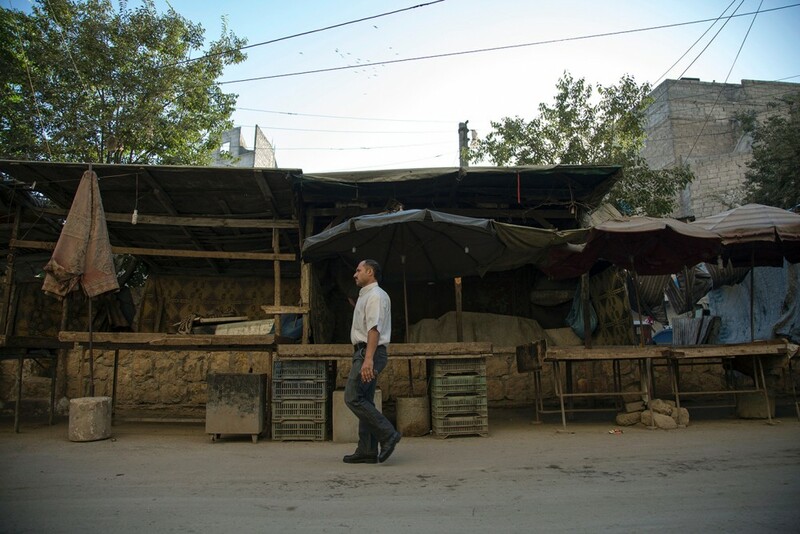 A Syrian man walks past an empty vegetable market in Aleppo on July 10, 2016, after the regime closed the only remaining supply route into the city. Humanitarian concerns aside, the sanctions are not achieving their objectives. Five years of devastating civil war and strict economic sanctions have plunged over 80 percent of Syrians into poverty, up from 28 percent in 2010. Ferdinand Arslanian, a scholar at the Center for Syrian Studies at the University of St. Andrews, says that reduction in living standards and aid dependency is empowering the regime.“Aid is now an essential part of the Syrian economy and sanctions give regime cronies in Syria the ability to monopolize access to goods. It makes everyone reliant on the government. This was the case in Iraq, with the food-for-oil system,” explained Arslanian. “Sanctions have a terrible effect on the people more than the regime and Washington knows this from Iraq,” argues Joshua Landis, director of the Center for Middle East Studies at the University of Oklahoma. “But there’s pressure in Washington to do something and sanctions look like you’re doing something,” he added. Despite the failure of sanctions, opposition advocates are agitating for even harsher measures that would extend sanctions to anyone who does business with the Syrian government. This, of course, would translate into sanctions against Russia. “The opposition likes sanctions,” says Landis. “They were the people who advocated them in the beginning because they want to put any pressure they can on the regime. But it’s very clear that the regime is not going to fall, that the sanctions are not working. They’re only immiserating a population that’s already suffered terrible declines in their per capita GDP,” he added. Top photo: A Syrian Red Crescent truck, part of a convoy carrying humanitarian aid, is seen in Kafr Batna on the outskirts of Damascus on Feb. 23, 2016, during an operation in cooperation with the U.N. to deliver aid to thousands of besieged Syrians.